Two-photon microscopy allows acquiring high-resolution images of living cells and organelles by using the low-energy infra-red laser light that penetrates deeper into a living animal’s brain without damaging it. This technology reveals exquisite details by visualizing individual cells (and even sub-cellular organelles) in their natural undisturbed environment. Since two-photon microscopy is non-invasive, it allows re-examining one and the same experimental animal (and precisely the same cellular ensemble) over and over again for days, weeks or months. This yields an unmatched wealth of information on disease progression and drug action dynamics and greatly increases statistical significance of the results. Two-photon microscopy (also known as Multiphoton Excitation Laser Scanning Microscopy) is based on the phenomenon of simultaneous absorption of two infra-red photons by a fluorophore (usually, a fluorescent protein, synthetic dye or tissue’s own autofluorescent component). Non-linear summation of two infra-red photons’ energy results in excitation of the fluorophore, which emits a photon in the visible spectrum. Since the likelihood of coincident absorption of two photons is strictly limited in space, visible photons are emitted only by those fluorescent molecules that are located exactly in the focal point. 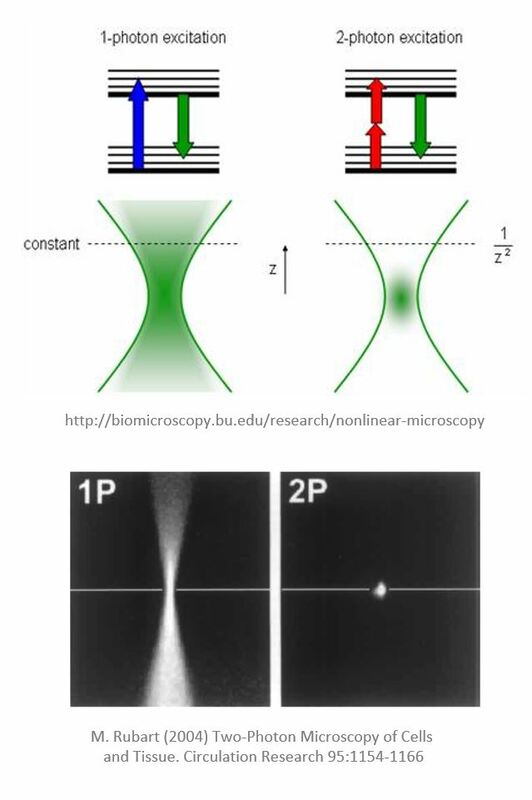 The emitted photons are then collected by sensitive photomultiplier tubes, while the pulsed infra-red laser scans point-by-point through the plane of interest (and plane by plane, stacking two-dimensional XY images into a Z-stack by shifting focus in the vertical direction). Finally, dedicated computer software combines the data into sharply focused 2D images and, eventually, into a reconstructed 3D volumetric image.